There’s no need to limit the potential of a coffee table to its classic function. A lot of modern coffee table design ideas presuppose multiple functionality – thus, there are expandable coffee tables, which can be transformed into dining tables when needed, wheeled coffee tables, used to serve food during lengthy dinner parties, coffee tables that may serve as laptop desks on occasions, etc. The shape of your coffee table may change the entire design picture of your living room. Of course, oval or rectangular shape of most coffee tables is dictated not only by aesthetic, but also by functional demands, so if you opt for a funky shaped coffee table, make sure it integrates well into your environment and serves its main purpose. Tempered glass – A great looking modern material, easy in maintenance and with impressive durability and quality. Tempered glass may be clear, frosted or tinted into any colour and looks amazing in contemporary settings. 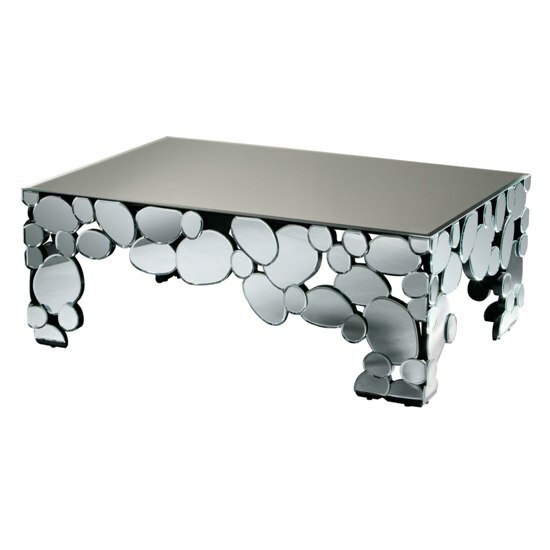 Note that glass surface looks perfect in combination with chrome or wooden table legs and frame. High gloss MDF – While high high gloss furniture is past the peak of its popularity, such solutions are still in fashion. High gloss furniture is suitable for luxury environments – some of glossy coffee tables feature led lights or diamante inlay. Solid wood – Nothing creates such sense of coziness and domestic comfort as solid wood. Some of the most popular modern coffee table design ideas suggest minimalistic approach and feature simple shapes and the complete absence of decorations – still, these units look stunning due to beautiful wood textures and patterns. Reclaimed wood – If you aim to create a one of a kind rustic look, opt for reclaimed wood coffee tables. Such solutions are second to none when it comes to creating recognizable rustic environment in a bachelour’s den or a country home. Palette racks – Some of the most recent modern coffee table design ideas suggest using palette racks to create a casual, welcoming atmosphere in a living room. Sure, the idea may seem a bit too funky, but if such unusual arrangement integrates well into your interior – why not give it a try? Stone – Another great idea is using stone as a base for a tempered glass or solid wood top. Although such solutions are a bit interior demanding, they do project a distinct aura of respectability and comfort.